Send generosity to any home or office with this healthful, delicious gift. A gathering of stone and exotic fruits sun-dried to perfection meets plump dates, seasoned almonds, fresh California pistachios, tender cashews and so much more. Presented in our royal blue gift box, this is sure to delight. 23 oz Dried Dates, Pineapples, Apricots, Apples, Plums and more. 24 oz Fresh Almonds, Cashews, Pistachios and more. Each gourmet item is carefully assembled inside our signature gift box for perfect presentation. A free card is included with your personal gift message or greeting. Personalize It! Complete the personalization option during checkout and we'll print your message on a satin ribbon. One line with up to 45 characters; requested text repeats across entire ribbon. Measures 13" x 9" x 5". Premium Nuts & Dried Fruit Abundance is a hand delivered gift. These gifts are delivered by one of our local design centers located throughout the United States and Canada. Same day delivery is available for most gifts when ordered before the cutoff time. 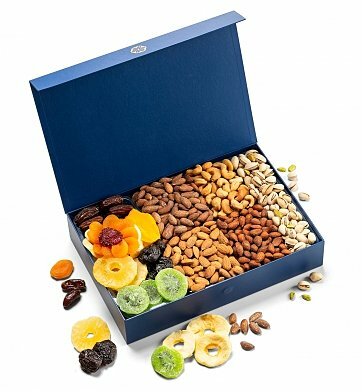 The cutoff time for Premium Nuts & Dried Fruit Abundance is 2 PM in the recipient's time zone. Vacaville Mixed Nuts TrayOverflowing 1.5 lbs of fresh cashews, almonds, pistachios and more, roasted to perfection and dusted with a finish of sea salt. 24 oz. Dried apricots, kiwi, pineapple, dates and more - all Certified Kosher. Roasted almonds, cashews and fresh pistachios - all Certified Kosher. Includes a complimentary note card bearing your personal gift message.